THE JORDAN VALLEY is part of the Great Rift Valley stretching from East Africa to northern SYRIA. Massive cracking of the Earth’s crust caused by tectonic plate movements under the continents of Africa and Asia formed a trench over 4,000 mi (6,438 km) long. The northern section created by this faulting activity is the Jordan Trench. In Syria, the Great Rift separates the Lebanon Mountains to the west and the Anti-Lebanon Mountains to the east. At Mount Hermon (9,232 ft or 2,814 m) melting snows and springs are the heads of the Jordan River, which traces the course of the Jordan Valley to its mouth at the DEAD SEA. The distance from Mount Hermon to the Dead Sea is only about 120 air mi (193 km), but the surface distance is 223 mi (360 km) owing to the river’s meandering. The word jordan means, “that which goes down.” The elevation drops from over 1,000 feet (305 m) above sea level at the foot of Mount Hermon to 1,340 ft (408 m) below sea level at the Dead Sea, which is the lowest surface area of the world. From Mount Hermon the Jordan River first descends to the basin of Lake Huleh, a dramatic drop in elevation of 900 ft (275 m) in a distance of about 10 mi (16 km). Lake Huleh was 3 or more mi (4.8 km) wide, but today it is a marshy area because the lake has been drained for agriculture. From Lake Huleh the Jordan River descends nearly 1,000 ft (305 m) through steep, rocky gorges. Just before entering the Sea of Galilee the descent slows and waters a plain near the village of Bet Zayda (Bethsaida). The Sea of Galilee (Lake Tiberias) is a freshwater body 689 ft (209 m) below sea level. When the Jordan River leaves the Sea of Galilee, it flows for about 24 mi (39 km) through a fertile region that supported a variety of agriculture in ancient times as it does today. It is also is joined by the Yarmuk River soon after it leaves the Sea of Galilee. The Yarmuk arises on the Transjordanian plateau and doubles the volume of the Jordan’s waters. The volume of water varies considerably from the wet season to the dry. South of ancient Pella the Jordan flows through the Ghor Plain, an ancient seabed composed of chalky limestone marls. As the Jordan descends to the Dead Sea, it is joined on its eastern (Jordanian) side by the Wadis Jurm, Kufrinjeh, Rajeb, and finally by the Jabbok River. In wet weather streams in the wadis come tumbling down from the granite Transjordanian Plateau. On the western (Israeli) side, the Jordan is joined as it flows south by the Wadis Bireh, Jalud, Malih, and Farah. The valley has several lateral faults that create the Jezreel Valley and the Saddle of Benjamin. As the Jordan River flows south it traverses a number of geological and climatic zones. The descent to the Dead Sea is accompanied by an increase in temperature. The Jordan’s southern end flows through badlands of soft gray saline marls. The whole rift valley floor is called the Ghor (Plains of Moab). Its narrow floodplain (Zor) contains thickets of thorn scrub and tamarish along its banks (“jungle of the Jordan”). The Dead Sea (Salt Sea or Sea of Arabah) is in the center of the Ghor Plain. At 1,340 ft (408 m) below sea level it is the lowest surface area of the world. The Dead Sea Valley (Wadi al-‘Arabah) is an extension of the Jordan Valley. It stretches 111 mi (179 km) from the Dead Sea to the port of Aqabah. It is a very dry area with little agricultural value. 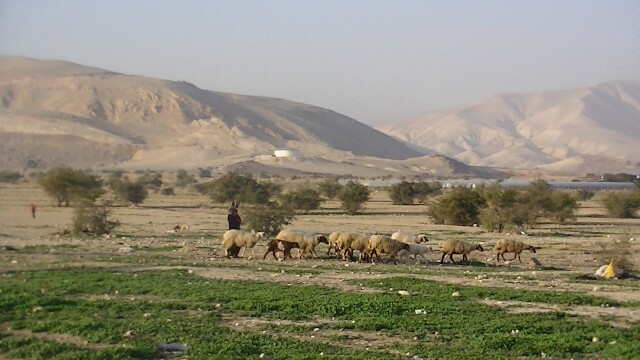 The Jordan River Valley figures frequently in the landscape of the Bible. Numerous passages include the separation of Abraham and Lot, the Hebrew children crossing the Jordan to fight the Battle of Jericho, and the baptism of Jesus in the Jordan River.